My Lady makes us healthy homemade pet treats all the time. She says they are good for us. I don’t know much about all that, but us pups sure do love em! We’re like kids waiting on their cookies to come outta the oven WOOF! Most of these are made with stuff that you humans eat, but it’s also good for us pets! So, ya know it don’t contain nothin’ bad for ya! We’ve gathered up a few of our favorite pet recipes from our blogger friends for ya! I also added a couple of our very own favorites here. We have yummy pet treats for dogs, cats and we even have a cool pinata for our chicken friends! Boy, that thing sure looks like fun! Check out these YUMMY Healthy Homemade Pet Treats! Thank you so much for posting these recipes! I made treats for my dogs just last week although they didn’t quite turn out the way I had hoped. We have the doggie cookie cutters rolling pin and “cookie” jar. I’m just trying to find the perfect recipe that they will like. Thanks again. I make my cat’s food. It’s a little time consuming but worth it. I know exactly what he’s eating, no fillers, no questionable “meal” – no preservatives etc. I thought he wouldn’t go for it because he was addicted to dry food but the transition was pretty seamless, except for a few minor bumps (he does not tolerate chicken skin). Like I said, homemade is worth it! What a great collection of treats. Sorcha loves homemade treats. This is so awesome. My furbabies and I thank you! Some of those look good enough for ME to eat. The Peanut Butter cookie treats look exactly like the human version hah! I bet my for baby would love these. I am definitely going to give it a shot. I’d like to try those Easy Peasy cat crackers (not me, for my cat, lol). Thanks for posting! These look great. We always make treats to give our furry friends for the Holidays so I will refer back to this list. Thanks for sharing! There are a couple treats my dog would like. I have made treats for her but never for my cat. I think I am going to give the salmon treats a try. 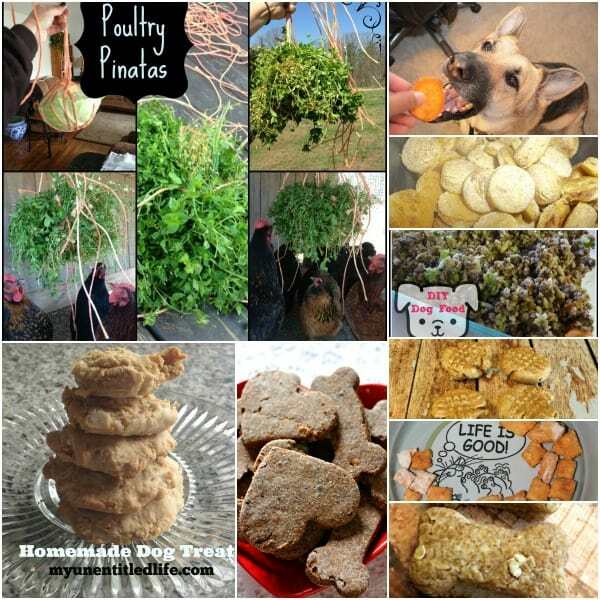 Thanks for the great recipes for homemade treats for our pup. These all sound awesome! I’m really interested in the DIY Homemade Dog Food recipe. We have started cooking for the dogs a few days a week so I am going to try that recipe first.